This moist, light chocolate cake covered in Swiss meringue buttercream has a secret ingredient, beets! The batter makes a very light fluffy cake and the frosting is creamy and not too sweet. A final dusting of raspberry powder gives a hint of zing and striking stripes! I was doing some recipe testing for a Red Velvet cake, trying to use natural ingredients to get a reddish color and I both failed and succeeded!! One of my cakes turned out totally brown but was so soft, fluffy, moist and delicious that there was no way I wasn’t going to share the recipe with you! 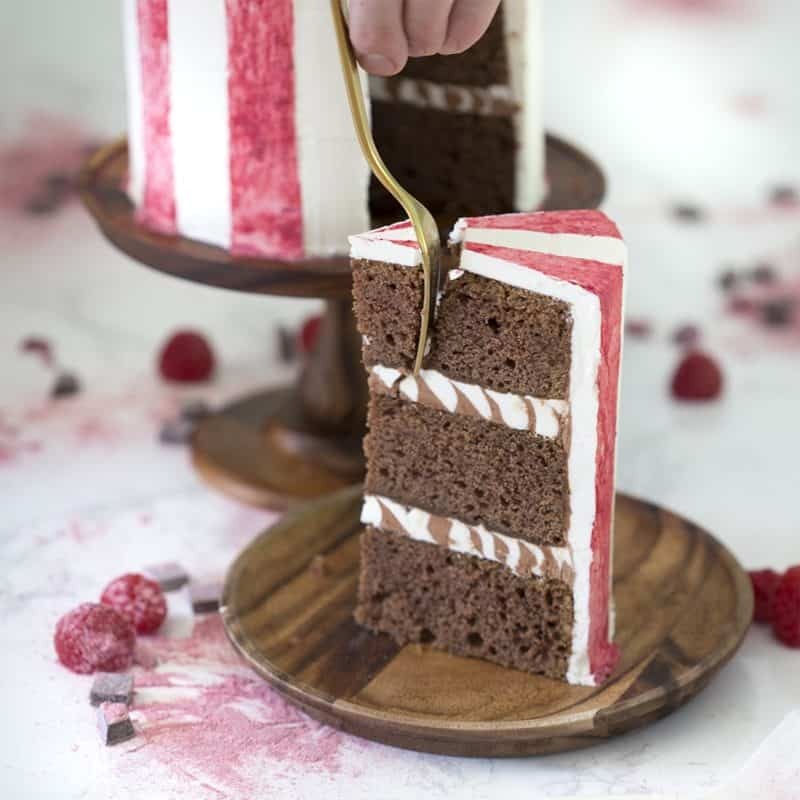 I complemented the cake with a creamy chocolate and vanilla Swiss meringue buttercream and made some raspberry powder to create these stripes. 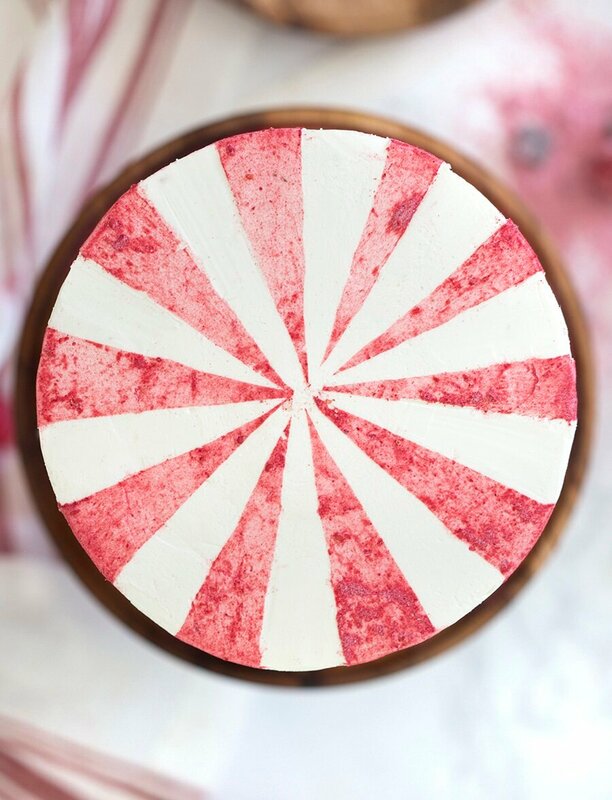 I thought the cake looked like a circus tent (in a good was), my husband thought it looked like a peppermint candy…. Thoughts? If you don’t have buttermilk then use whole milk and mix in a teaspoon of lemon juice. Hate beets? Try using apple sauce or mashed bananas instead! If you don’t want to make Swiss buttercream you can use the American variety. You can use cocoa or shaved chocolate for the strips in place of the raspberry powder I used. Preheat the oven to 350 degrees F. Butter and cocoa powder three 6-inch cake pans. In a standing mixer fitted with a paddle attachment, cream your room temperature butter. Add in sugar and mix on medium until combined. Add eggs in one at a time and beat. Add vanilla extract. In a separate bowl, combine vinegar and buttermilk. Sift the cocoa powder into the butter mixture. Add beets. In a large bowl, sift the dry ingredients together. Add ½ of the dry and ½ of the wet to the butter mixture until combined. Add the buttermilk mixture and mix until combined. Pour the batter into three prepared pans. Add any extra batter to a cupcake paper. This will be used for the crumble. Add damp baking strips. Bake for about 30-35 minutes or until the centers are springy to the touch. When done, let them cool in their pans for about 5 minutes, then dump them out onto a wire rack. Add egg whites, sugar and salt in a bowl. Give the mixture a brief whisk. Place the bowl over a pan of simmering water. Make sure the water does not touch the bowl. Whisk the egg whites occasionally while it warms up. When the mixture has warmed, whisk it constantly. You will heat the mixture until it reaches an internal temperature of 160ºF or until it’s not grainy between your fingers. Transfer the bowl to a stand mixer with a paddle attachment. Whip until you get room temperature glossy peaks. While the mixture is running on low, add tablespoon sized dollops of room temperature butter making sure to let the butter incorporate before you add the next piece. Melt the chocolate in two 30 second bursts and 1/2 power. Cover it and let the rest of the chocolate melt and come to room temperature. Transfer 1.5 cups of the Swiss meringue buttercream to a bowl. Add your desired amount of chocolate. Any extra can be used for a ganache! Mix with a spatula until everything is incorporated. In a blender, add confectioners sugar and raspberries. Blend until a fine powder. 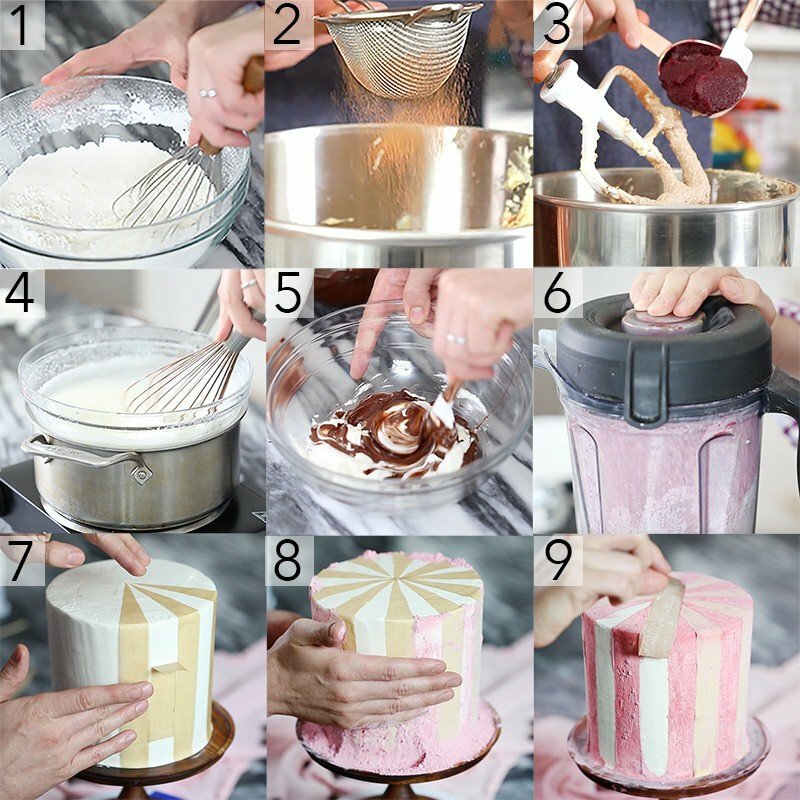 Assemble the cake, cover in buttercream, smooth, and transfer to the fridge to chill. With parchment paper, use a ruler and pencil to sketch out the pieces for the stripes on the cake. The height of the strip should be the height of the cake plus the radius of the cake. Make a fold at the cake’s radius, the part of the strip that will rest on the cake’s top will be cut into a triangle. Press strips of paper onto the chilled cake. Add the powder between the stripes. Use an air duster or brush to remove the excess raspberry powder. Remove the strips. I used an exacto knife to perfect the stripes that had bled under the parchment paper. If you’ve tried this chocolate beet cake then don’t forget to rate the recipe and let me know how you got on in the comments below, I love hearing from you! 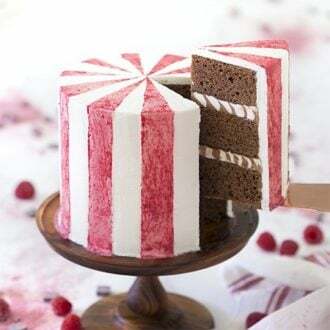 A fluffy, moist chocolate cake covered in creamy Swiss buttercream and raspberry stripes. Beets add tons of moisture to the batter! Preheat the oven to 350 degrees F. Butter and cocoa powder three 6-inch cake pans. In a standing mixer fitted with a paddle attachment, cream your room temperature butter. Add in sugar and mix on medium until combined. Add eggs in one at a time and beat. Add vanilla extract. In a separate bowl, combine vinegar and buttermilk. Sift the cocoa powder into the butter mixture. Add beets. Mix on low. Add ½ of the dry and ½ of the wet to the butter mixture until combined. Add the buttermilk mixture and mix until combined. Pour the batter into three prepared pans. Add damp baking strips. Bake for about 30-35 minutes or until the centers are springy to the touch. When done, let them cool in their pans for about 5 minutes, then dump them out onto a wire rack. Add egg whites, sugar and salt in a bowl. Give the mixture a brief whisk. Place the bowl over a pan of simmering water. Make sure the water does not touch the bowl. Whisk the egg whites occasionally while it warms up. When the mixture has warmed, whisk it constantly. 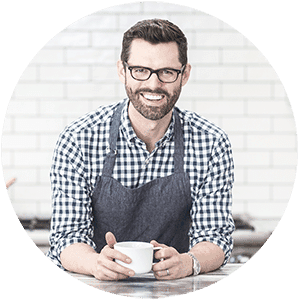 You will heat the mixture until it reaches an internal temperature of 160ºF or until it's not grainy between your fingers. Transfer the bowl to a stand mixer with a paddle attachment. Whip until you get room temperature glossy peaks. While the mixture is running on low, add tablespoon sized dollops of room temperature butter making sure to let the butter incorporate before you add the next piece. Melt the chocolate in two 30 second bursts and 1/2 power. Cover it and let the rest of the chocolate melt and come to room temperature. Transfer 1.5 cups of the Swiss meringue buttercream to a bowl. Add your desired amount of chocolate. Any extra can be used for a ganache! Mix with a spatula until everything is incorporated. Snip the tips off of the chocolate buttercream and plain buttercream, then add to a piping bag fitted with a round tip. Pipe the swirl between each layer and repeat the process. Add the chocolate swirl between each layer. Cover the cake in white plain buttercream, smooth, and transfer to the fridge to chill. 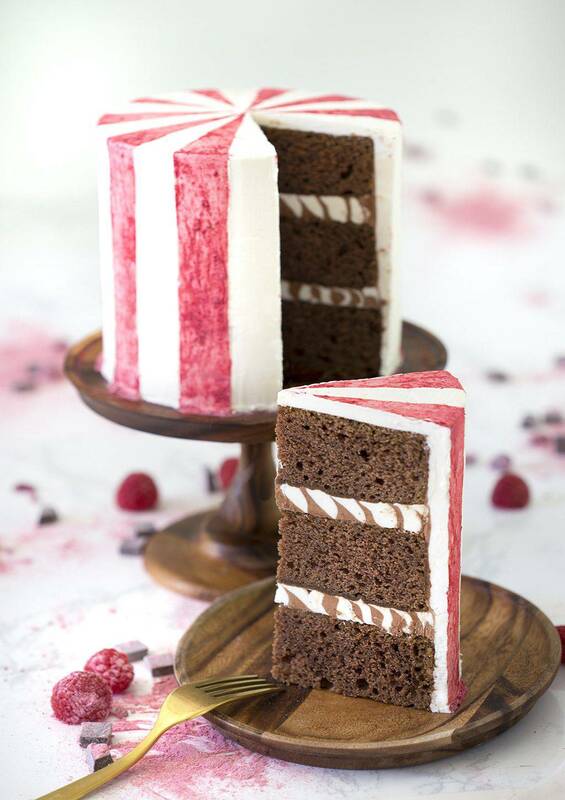 With parchment paper, use a ruler and pencil to sketch out the pieces for the stripes on the cake. The height of the strip should be the height of the cake plus the radius of the cake. Make a fold at the cake's radius, the part of the strip that will rest on the cake's top will be cut into a triangle. Press strips of paper onto the chilled cake. Add the raspberry powder between the stripes. Use an air duster to brush off the excess raspberry powder. I used an exacto knife to perfect the stripes that had bled under the parchment paper. If yo don't have buttermilk then use whole milk and mix in a teaspoon of lemon juice. How did you do the filling? I could not find the instructions on how to get the cute brown and white combo. Thanks you! Take a look now or check out my video! I hope you enjoy the cake! This recipe was DELICIOUS! I skipped the stripes and added some fresh raspberries. I’m so glad you loved the cake! Adding raspberries must have been EXTRA tasty!